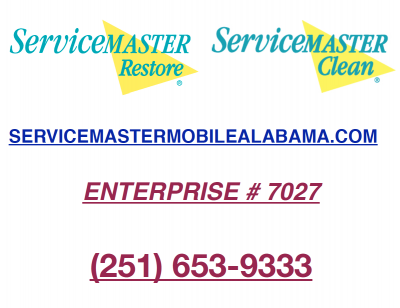 ServiceMaster, The Master of Disaster in Mobile, Daphne, Theodore, & Foley, AL has been serving water damage and fire damage customers in Mobile and Baldwin Counties in Alabama for thirty years. This article covers only what to expect AFTER the fire. 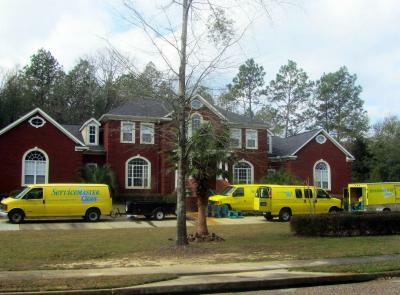 We have many other articles on fire prevention, contents cleaning and structure cleaning and virtually every other mitigation subject imaginable on our web site http://www.servicemastermobilealabama.com. No fire damage situations are exactly alike. Many variables come into play such as the amount of heat generated, the severity, the exact composition of the burning material, and how long the event lasted. 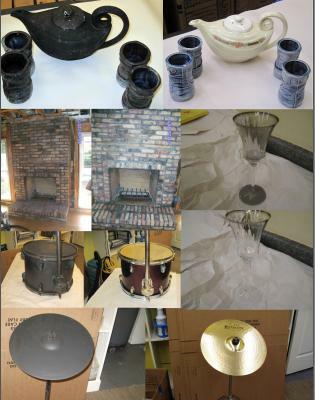 At a minimum, ServiceMaster is called upon to clean up smoke damage from a simple burned pot on the stove. At a maximum, we are called upon to clean up a fire from a large commercial structure where a significant amount of the structure was fully engulfed. We clean both situations and everything in between. In a typical home fire, there may be a need to clean both structure (the physical home), and contents (your belongings). The contents of some small fires can be cleaned on site at the same time the structure is being cleaned. In more severe situations, the contents will need to be packed-out and the homeownere will need to be relocated while repairs are done. Where there is insurance involved, often the insurance adjuster will work with the mitigation company and the homeowner to determine an agreed-upon scope of work. This may entail packing out and cleaning of contents, cleaning structure, and the rebuilding of affected areas. ServiceMaster Advanced provides all levels of support for fire victims. We handle the pack-out, moving, storage, cleaning and return of contents. We also provide the mitigation and cleaing of smoke damaged structure and we can arrange to have all of the repairs done. We are the only ServiceMaster company that offers the level of support and cleaning that is required of a full-service mitigation company. We are the only ServiceMaster company in the Mobile or Baldwin County area that has been performing these services for thirty years. We are the only ServiceMaster Company in either county that has a six person fire cleanup team that does specializes ONLY in fire cleanup. Other companies do fire contents and structure cleanup as a side business ot their contracting services. 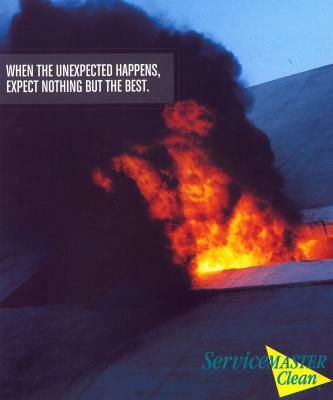 NO ONE SPECIALIZES IN FIRE CLEANUP, HAS THE YEARS OF EXPERIENCE, AND DEPTH OF TRAINED PERSONNEL THAT SERVICEMASTER ADVANCED DOES. We do not speak for others, but we know our capabilities and we have a strong (thirty-year) track record. Beware of one-stop providers who say they can do it all. Many simply can't do the cleaning and you might find yourslef paying for services that they simply couldn't do. You may ask these companies to meet the team that will actually be performing the cleaning work. You may ask them what credentials their personnel have. You may also inquire as to how long a given company has been doing fire mitigation (not re-build). We suggest that you do. Over the years, we have learned that it is a far better business model to become the area's industry leading expert in one field - migitation & remediation - and assist our customers in their repair needs. By doing this, we have cultivated some very thankful customers, have saved many of them thousands of dollars in repairs, and have made many friends in the construction and home repair industry as well. There are many ways in addition to the above the we can assist the homeowner and contractor in a remodel, water or fire damage, or mold situation. The key is that unlike many small companies in the remediation business, we are honest and our primary concern is reducing the cost to the customer. We know that in the long run, this service oriented approache will pay dividends. We have many artilces and videos on how we approach the mitigation business. 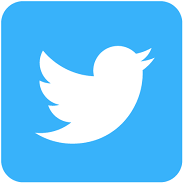 Try visiting our site to see what we are all about. http://www.servicemastermobilealabama.com. For further information, contact ServiceMaster Advanced Cleaning (251) 653-9333 or (251) 928-1028 in Baldwin County. The “Master of Disaster”. If you have an insurance agent or adjuster, make sure you tell them to contact ServiceMaster Enterprise number 7027. "We would be honored to serve you."